I know that I have been mentioning shoes hell of a lot recently, but I feel like I am just having a moment with shoes in general at the moment. You guys will probably already know that I have a deep love for all things shoes and bags, but I feel like I am most definitely teetering more on the shoes side of things at the moment. I feel like at the moment I am at a stage where I love all of the shoes in my collection and that is why I wanted to write this post for you guys today because I finally feel like I am at a point where I have ever pair of shoes that I could need without having to go out and pick anything else up! I know that I probably shouldn’t wear my wedding shoes before the big day, but I have been wearing these shoes so much recently. I am saying that I have been doing it just to bed in the shoes so that they are lovely and comfortable on my wedding day, but in actual fact I just really want to wear these shoes. Whenever I wear these stunning Manolo Blahnik heels, I get so many compliments on them. They are an eye-catching pair of heels that people just seem to completely adore. I think a pair of shoes like this is all about what you pair them with and I think that these are beautiful with a very paired down monochromatic outfit. I think these costs me near on £800, but in my eyes, they were worth every single penny and I cannot wait to wear them on my wedding day! If you guys have followed my blog for some time, you may know that I picked up these Valentino heels last year when I was the maid of honour for my sister and I have been in love with them ever since. I had wanted to invest in these shoes for years, but because of the steep price tag, I simply couldn’t bring myself to do it. In the end, I decided to finally go ahead and treat myself to these for such a big occasion. Not only are these the most stunning heels, they are also incredible comfortable to wear, and I always get tons of compliments on them. I can remember when I first unboxed these, I was in love within an instant. I know that this is another very expensive pair of shoes, but one that I am in love with! I feel like these heels are something very different for me to mention here on my blog, but from the moment that I got these, I fell in love with them. As you guys probably already know, I am a very monochromatic kind of person and I always go for neutrals, but I wanted a pair of shoes that were a little different and that is what these ASOS heels were. When I am wearing an all-black outfit and I throw these heels on, I feel like they just really elevate the look. With the style of these heels, you would be foolish to assume that they would be comfortable because they are in no way comfortable, but I love to wear these because thy always look simply stunning! These are another pair of high-street boots that I want to mention, and I thought that I would add them in this blog post because as I think about it, I have worn these boots half to death over the past couple of months through the colder winter weather. I feel like a good pair of winter boots that still look chic as hell is an absolute essential to have to in your closet. I think I picked mine up from ASOS, but they are Miss Selfridge brand and they are just great shoes. They look good with tights, dresses and skirts. I really have used and abused these suede boots over the past couple of months and I feel like you can start to see that, but I still love these and wear them so much throughout my working week! I hope that you guys enjoyed this blog post and getting to see some of my favourite shoes. You will probably already know by now that I love to splurge on shoes, but I also have some standard heels and boots from the high-street that I simply cannot be without. Make sure to leave me a comment down below and let me know what some of your favourite shoes are that you reach for all of the time! Those Valentino heels have my heart. So glad you finally invested in them! They are stunning. They are just such a stunning pair of shoes! They are super comfortable, I can wear them all day with no issues! Those blue Manolos are soooo cute! I don't like wearing shoes that are too high (I prefer to have my heels be 2 inches max) since they are pretty comfortable and I don't want to be taller than me husband (we're only 4 inches apart). That is true, my husband to be absolutely towers over me, so I need those extra inches! These are all so beautiful! I've had Manolo's on my wishlist for ages! 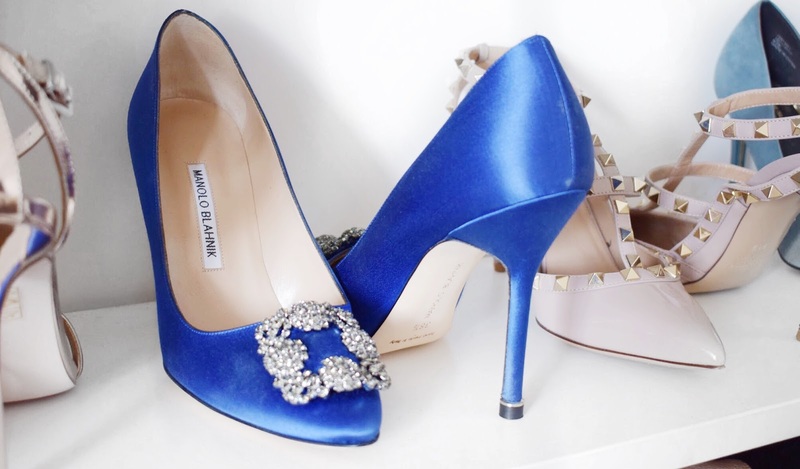 Manolo Blahnik is just such a stunning and truly timeless brand! I am such a shoe addict! They are some of my favourite shoes! They are, I have loved them for many years! Those shoes are beautiful. I LOVE the Manolos! Manolos will always be my favourite! Ohh what beauties! I need a pair of Valentinos in my life! I honestly cannot believe how comfortable they are! The Valentinos are so pretty! Ugh I want those! They are to die for and well worth the money! OMG they are all to die for! I am just so in love with my shoes! There was no pair of shoes that I would rather wear! You have some gorgeous shoes. The Valentino Rockstud heels are so pretty.